Toronto, Ontario, Canada metallers CAULDRON will release their fourth studio album, “In Ruin”, on January 8 via The End Records. High Roller Records will make the album available in Europe on January 29. The cover artwork for “In Ruin” can be seen below. Comments CAULDRON‘s Jason Decay: “We wanted a basic, straight-to-the-point cover without going totally METALLICA ‘Black’ album; something that catches your eye when flipping through the record bin. 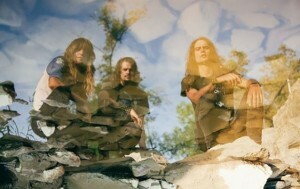 For the CD, the trio returned to the Lincoln County Social Club recording studio in Toronto, where they recorded two of their previous albums, “Burning Fortune” (2011) and “Tomorrow’s Lost” (2012). CAULDRON was born out of the ashes of genre-defining, critically lauded GOAT HORN, the band known for being heavily influenced by BLACK SABBATH, VENOM and JUDAS PRIEST that called it a day in 2006. 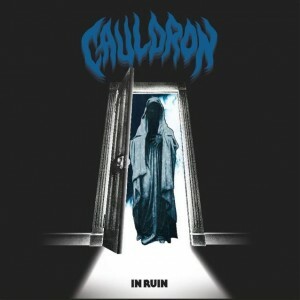 Since then, CAULDRON has released the “Into The Cauldron” EP (now long out of print), as well as three full-length albums: “Chained To The Nite” (2009), “Burning Fortune” (2011), “Tomorrow’s Lost” (2012) and the “Moonlight Desires” EP (2014). The band has toured the world with the likes of MUNICIPAL WASTE, DEATH ANGEL, NEVERMORE, DIAMOND HEAD, ENFORCER, and in the summer of 2013, were invited to play METALLICA’s Orion Music + More festival in Detroit. “Burning Fortune” was nominated for a Juno Award in 2012 while the video for the single “All Or Nothing” has been viewed over 460,000 times on YouTube to date and was featured in the video game “Rock Band”.